A Charmed Wife: It's a Tie! I'm headed to California today to help my friend, Lea, make the final preparations for her wedding next weekend. In honor of this auspicious occasion, and because this is our last wedding of the season, I have decided to make this "Wedding Week" on the blog. Don't worry if you aren't a bride- or groom-to-be, however -- I'll try to make this week's post applicable to the soon-to-be-hitched, already-wed, and don't-believe-in-the-institution-of-marriage, alike. Read on, lovers. 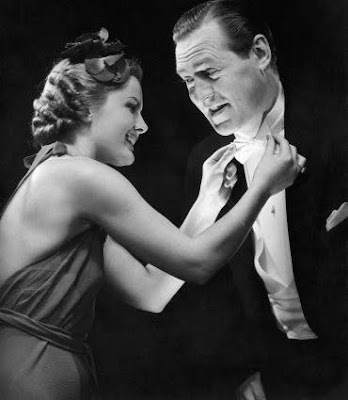 Because I always enjoy those special moments in the movies when the young woman shares a touching exchange with her father (or grandfather ... or Crocodile Dundee) while helping him to tie his necktie, I made a point of learning the skill myself. Disappointingly for me, however, my father, brother, and husband are all perfectly capable of tying their own ties (prefer to do so) and, in fact, have never once enlisted my help. In the meantime, I still think it's a talent worth having in your arsenal, because you never know when you are going to encounter a pack of bewildered groomsmen or just happen to bump into Matthew McConaughey on his way to collect an Oscar, bow tie in hand. Okay, you're right, Matthew McConaughey is never going to win an Oscar, but you know what I mean. And should you encounter a well-tanned Aussie with leather vest and machete wandering around helpless with a cravat, let me know. Read on, and you'll soon find yourself fit to be tied ...or fit to do the tying. One of those. Step 1: Start with the tie around your (or the person you are sharing an intimate made-for-TV moment with's) neck, with the wide end hanging about 10-12 inches longer than the skinny end. Cross the wide end in front of the skinny end. Step 2: Wrap the wide end around the back of the skinny end, folding it, so the back side of the wide end is exposed. Step 3: Wrap the wide end around the front of the skinny end again, folding it so that the front side of the wide end is exposed again. Step 4: Pull the wide end up and through the part that goes around the neck. Step 5: Bring the wide end down and through the small loop that is front and center (under the Adam's apple). Step 6: Pull the skinny end downward to tighten, and shape the knot gently with your fingers. Perfecto. Step 1: Start with the tie around the neck, with one end hanging 1 - 1 1/2 inches longer than the other. Step 2: Cross the long end in front of the short end, and pull up through the loop that is around the neck. Step 3: Fold the short end in half (forming one half of the bow), and tuck it up horizontally by the shirt collar. Step 4: Bring the long end down in front of the (folded) short end, and (like tying a shoelace) tuck it in half back behind the loop formed by the short end, forming a bow. Step 5: Slip one index finger inside each loop, grab onto the tie ends, and pull to tighten and straighten. Step 6: Enjoy the ball, Cinderella (or Cinderello, I guess).